The monolithic, three-story Cultural Center was initially constructed in 1949 as the 4-H Girl’s Club dormitory. Originally, the outer walls featured engravings of the 4-H logo on the corners of the building and an inscription above the center doors labeling the structure as the Girls’ Club. In 1981, the facility was re-opened as the Cultural Center, featuring new lighting, increased open interior space, new display cases and a fresh coat of paint. Today, the Cultural Center is a glittering showcase for Iowa artisans and a Fairtime residence for an impressive variety of artists. The Fair’s arts show is the state’s largest. In 2007, Patty and Jim Cownie of Des Moines committed $750,000 to the Iowa State Fair Blue Ribbon Foundation for the Cultural Center. 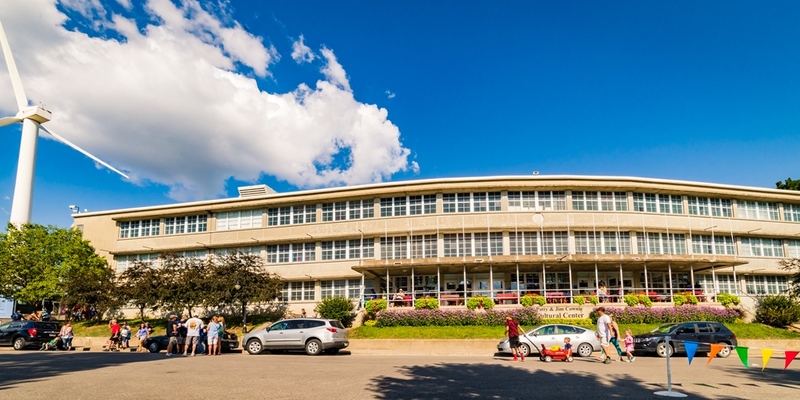 The funds will be used for infrastructure and cosmetic renovations to include electrical, plumbing, handicap accessibility, windows, climate control, and façade and courtyard enhancements. “The Iowa State Fair is part of the fabric of our state. Patty and I are pleased to offer support in this small way,” said Jim Cownie. Two elevators were installed for the 2012 Iowa State Fair. These elevators on the north and south sides of the atrium assisted Fairgoers in more accessing the upper level exhibits. While there is still much to be done to preserve our beautiful and historic building, the addition of the elevators was a major step in making the facility more accessible to its patrons. In 2013, renovations continued on the south end of the Cultural Center with the addition of storage space, offices, family restrooms and more exhibit space. The Blue Ribbon Foundation received a $40,000 grant from Prairie Meadows through its 2014 Community Betterment Grant Program. By Fair 2014, the Patty and Jim Cownie Cultural Center’s phase three renovation was complete. The north side of the building was finished, the third floor was fully accessible to the public and the new home for the photography exhibits. The conversion of the third floor from dormitory space to exhibit area allowed the Fair to offer expanded programming within the Cultural Center to reach a larger audience and explore more aspects of our culture. One goal of the Cultural Center renovation was to increase circulation throughout the building allowing traffic to navigate with ease. The addition of an exterior staircase gives access to the paved courtyard. There were also improved entrances to the first and second floors from the east side of the building.